This beautiful ornament is not only easy to make, but it can be come a wonderful family tradition year after year. 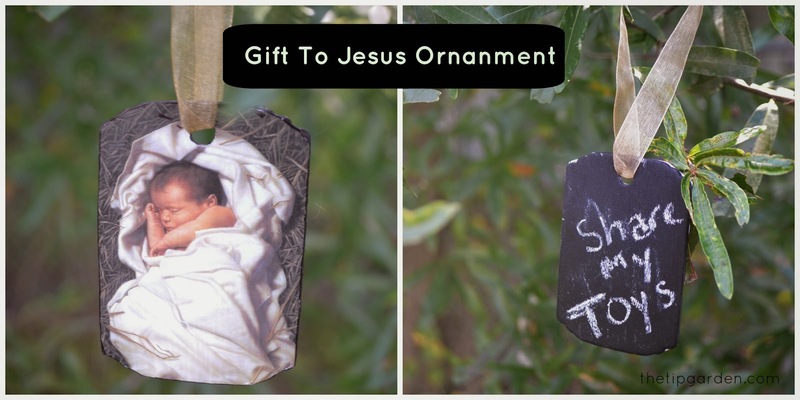 With chalkboard on one side and a picture of the infant Jesus on the other, it lets each family member write what their "Gift to Jesus" will be each year. I don't often share a religious craft, but I do love this one. It would be perfect to make and give as a gift for a Sunday School class, or for a craft for a youth group to make before the holidays. I will be making these for our extended family (surprise, guys!) and sending along a piece of chalk to go with. Jan's Tip: Tags: I used precut wooden tags that were 29 cents each at the craft store, but you can also cut your own out of scrap wood as well. My tags were approx. 2x3 inches and had precut holes in them for hanging. Pictures of Jesus: You can use any image that will fit the size of your tags. I purchased the ones I am using from here. (as of this posting it was listed as unavailable). They are a 3x4 inch card that I trimmed down to fit. If you can find a free image that does not have a copy right on it, you could easily copy and paste it into the size you need and print them off on paper to use. Any cute clipart could be purchased for a small fee from many sites, even a sticker could be used. Get creative and you'll find something! Cost: I spent 30 cents on each tag, 50 cents on each photo. 99 cents on a small bottle of chalkboard paint. Already had the sponge brushes, and made my own modge podge wtih glue I had on hand. Used ribbon I already had, so total cost was under a dollar each for me today using items I already had. chalk for giving with ornament. 1) Paint one side of tag adn the sides/edges of tags with chalkboard paint. (I let it dry and painted 2 coats). 2) Center picture onto unpainted side of tag, and glue down using modge podge. then Trim any overhanging edges. 3) Using Modge Podge coat top of picture with coating to seal and let dry. (it will dry clear). I did 2 coats. 5 ) Using a hole puncher, center it through the pre-cut hole and press to punch a hole into the photo. 6) Thread hanging ribbon through hole at top of ornament. What a Wonderful and fun project to make. I'm so glad that you decided to share this. I love seeing projects like this and gives my grandkids something to work on in the besides. 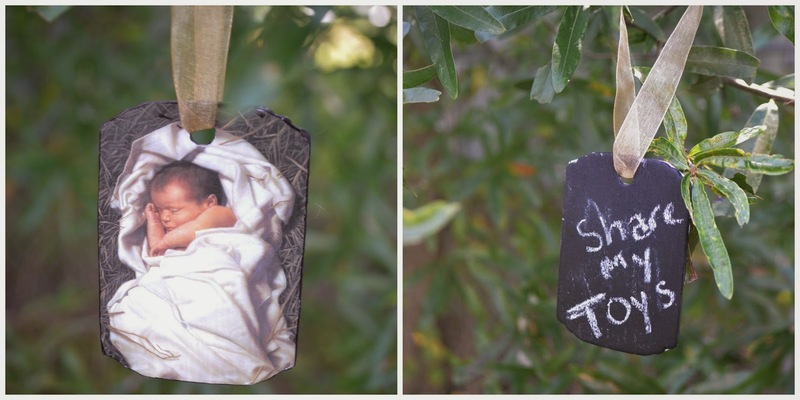 This project would be so nice to make a whole nativity scene of these to hang on a child's own tree. Did I say that I Absolutely love this project? :} Will be passing this project along to friends and other family members. aww, I am so glad you love it! Simple but beautiful. I love the idea of the entire Nativity scene! A whole set would make such a lovely gift! maybe a scripture on the back of each one that tells that part of the story? and then the Baby Jesus one, left blank on the back so the kids could write down their gift to Him that year? Did I tell you that I Absolutely Love this cute and easy project?